Abstract The pathway for synthesis of polyhydroxybutyrate (PHB), a polyester produced by three bacterial enzymes, was transferred to the tobacco plastid genome by the biolistic transformation method. The polycistronic phb operon encoding this biosynthetic pathway was cloned into plastome transformation vectors. Following selection and regeneration, the content and structure of plant-produced hydroxybutyrate was analysed by gas chromatography. Significant PHB synthesis was limited to the early stages of in vitro culture. Within the transformants, PHB synthesis levels were highly variable. In the early regeneration stage, single regenerates reached up to 1.7% PHB in dry weight. At least 70% of plant-produced hydroxybutyric acid was proven to be polymer with a molecular mass of up to 2,500 kDa. PHB synthesis levels of the transplastomic lines were decreasing when grown autotrophically but their phb transcription levels remained stable. Transcription of the three genes is divided into two transcripts with phbB being transcribed separately from phbC and phbA. In mature plants even low amounts of PHB were associated with male sterility. Fertility was only observed in a mutant carrying a defective phb operon. These results prove successful expression of the entire PHB pathway in plastids, concomitant, however, with growth deficiency and male sterility. Polyhydroxybutyrate (PHB) belongs to a class of polyesters of 3-hydroxy acids that are synthesized in various bacterial genera (Schubert et al. 1988 ; Hai et al. 2001 ). These polyhydroxyalkanoates (PHAs) are used as an energy source and also for carbon storage. In the bacterium Ralstonia eutropha, PHB is derived from acetyl-coenzyme A (acetyl-CoA) by a sequence of three enzymatic reactions (Schubert et al. 1988 ; Slater et al. 1988 ). First condensation of two molecules of acetyl-CoA is catalysed by beta-keto-thiolase (EC 2.3.1.9) to form acetoacetyl-CoA. Acetyl-CoA reductase (EC 1.1.1.36) then reduces acetoacetyl-CoA to ß-hydroxybutyryl-CoA, which is then polymerized by PHB synthase (EC 2.3.1.-) to PHB. In R. eutropha the genes for these enzymes are organized in a single operon (Peoples and Sinskey 1989 ). There is considerable interest in PHAs, since they can be used as biodegradable plastics and elastomers, which under optimal conditions are degraded completely to CO2 and H2O. Additionally, depending on the structure of the hydroxyacid side chains, the physical properties of PHAs are extremely variable (Anderson and Dawes 1990 ; Seebach and Fritz 1999 ). Up to now, increased usage of PHAs has been restricted due to high production costs. PHAs produced in bacterial fermenters are at least five times more expensive than chemically synthesized polyethylene. Because of this, the usability of bacterially generated PHAs is reduced to small-scale and special applications. PHA production could be made more efficient by connecting its bacterial biosynthetic pathway to chloroplast fatty acid metabolism (Poirier et al. 1992 ). Remarkable results were achieved in this area by nuclear transformation of Arabidopsis (Nawrath et al. 1994 ; Poirier 1999 ; Bohmert et al. 2000 ) and rapeseed (Houmiel et al. 1999 ). However, nuclear transformation bears the potential risk of an undesired spread of transgenic pollen into the environment. As pollen rarely transfers plastids (Corriveau and Coleman 1988 ) we decided to integrate the phb operon into the plastome. In continuation of preliminary experiments reported by Lössl et al. ( 2000 ), we initially transferred the original R. eutropha phb operon, including bacterial regulatory elements, to the tobacco plastome. In order to improve genetic compatibility, we then replaced these elements of the phb operon by a 5 region of plastid origin (Eibl et al. 1999 ), which is expected to confer high expression. Production of true 3HB polymer in plants has only been reported previously using nuclear transformation (Poirier et al. 1992 ; Nawrath et al. 1994 ; Houmiel et al. 1999 ; Bohmert et al. 2000 ). In a recent preliminary communication, Nakashita et al. ( 2001 ) claim PHB synthesis following plastid transformation; expression levels were, however, extremely low, at only 8 ppm and no evidence for polymer production was provided. We conclude that our present results provide the first evidence for plastid transformation-mediated 3HB polymer production. The phb operon was cloned into transformation vectors by ligation of inserts, not by integration of amplified PCR products (compare Nakashita et al. 2001 ). Completeness and fidelity of the operon reading frame was verified by sequencing. This control of intactness was necessary in order to rule out damage to the operon during cloning. All cloning procedures were carried out using standard methods described in Sambrook et al. ( 1989 ). Nucleotide (nt) positions for transgene insertions as illustrated in Fig. 1 are given according to the plastome sequence data for EMBL accession no. Z00044 (Shinozaki et al. 1986 ). For integration of the phb operon with plastid expression control elements, the transformation vector pKCZ was used (Zou 2001 ; Huang et al. 2002 ). This pUC19 based vector contains plastome homologous flanks including loci trnN and trnR within the inverted repeat (IR) region. Plastome insertion flanks for series P were located in IR-A (nt 109230–110348 and nt 110349–111520) and in IR-B (nt 131106–132277 and nt 132278–133396) respectively. After PCR amplification by pfu polymerase the psbA promoter and 5 UTR were linked to the 5 end of phbC in the pUC vector by ligation of an NcoI-KpnI-cut fragment. This 5 region was transferred to pHBR68 (Schubert et al. 1988 ), the phb operon-containing vector by cut and ligation of a BamHI-AgeI fragment. In a final step the operon with 5 psbA motifs was excised by SmaI and XhoI and transferred to transformation vector pKCZ cut by SacII and XhoI, after generating blunt ends using Klenow fragment. The construct contained the aadA resistance marker cassette under control of the 16S-rDNA promoter downstream of the operon and was terminated with the 3 -end (450 bp) of the Chlamydomonas reinhardtii rbcL gene (Koop et al. 1996 ). Nicotiana tabacum L. cv. Petit Havana plantlets (Surrow Seeds, Sakskøbing, Denmark) were grown from seeds in vitro at 25°C (0.5–1 W/m2 Osram L85 W/25 universal-white fluorescent lamps). For particle gun mediated transformation (Svab et al. 1990 ), DNA on the surface of gold particles (0.6 µm) was introduced into leaf chloroplasts using a PDS1000He biolistic gun (DuPont). Selection and regeneration of transgenic calli were carried out on RMOP medium (Svab et al. 1990 ). After 4–6 cycles of repetitive shoot regeneration on spectinomycin and streptomycin (500 mg/leach), shoots were transferred to B5 medium (Gamborg et al. 1968 ) with spectinomycin for root formation. DNA was extracted from 100–150 mg in vitro or greenhouse plant material using the DNeasy plant DNA isolation kit (Qiagen, Hilden, Germany). PCR was carried out with the sense primer located in the transgene and the antisense primer positioned in the plastome outside the vector flanks. 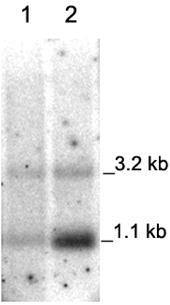 For Southern blots, 3 µg digested total plant DNA was separated on 0.8% agarose gels. Blots were prepared by transfer to nylon membranes (Hybond-N, Amersham). Specific probes were random prime labelled with 32P using Klenow fragment and hybridized to the membranes. Hybridization was carried out overnight at 65°C in Church buffer (0.5 M sodium phosphate, pH 7.5 and 7% SDS). Filters were also hybridized simultaneously with a probe derived from lambda DNA in order to detect size marker bands. Blots were washed twice at 50°C in 0.1% SDS and 2×SSC, pH7 for 30 min and once at 65°C in 0.1% SDS and 2×SSC for 30 min. Filters were exposed on imaging plates for 8 h and signals were detected using a phosphoimager (BAS-1500, Fuji, Tokyo). Total RNA was isolated from 30–100 mg plant material (leaves) using a RNeasy plant mini kit (Qiagen). About 5 µg RNA were separated on 1.2% formaldehyde-agarose gels and transferred to nylon membranes. Blotting was carried out as described by Sambrook et al. ( 1989 ). Random primed 32P-labelled DNA probes were hybridized to the membranes as described for Southern blotting. Membranes were washed with 0.1×SSC, 0.1% SDS at 65°C. Signal strength was determined using the phosphoimager. PHB contents were measured in leaf material and callus. For monomer determination, preextraction with ice-cold methanol was performed. PHB contents were measured by gas chromatography using a 10m-CP-WAX-52CB column with a diameter of 100 µm and 0.2 µm liquid phase. The procedure was adapted to small volumes and a short GC column according to Brandl et al. ( 1988 ). PHB contents were corroborated by HPLC after hydrolysis to crotonic acid in 200 µl concentrated sulfuric acid for 60 min at 100°C. After addition of 400 µl deionized water, 800 µl 15% ammonia and 200 µl 100 mM ammonium acetate (pH 4.6) followed by 0.22µ-filtration, 10–20 µl aliquots were injected into a Synergi Polar-RP column, 150×2 mm, with 4 mm precolumn using 15 mM phosphoric acid as eluent. For molecular weight determination, 20 mg dry sample was extracted in a fexIKA hot solvent extractor; 2 ml screw cap vials were combined using a Kimble-Kontes 8-425 connector and two Teflon filters (5–10 µm and 10–20 µm). Extraction was performed with 600 µl dichloromethane in 40 cycles (87°C 1 min, 67°C 1 min, stirring at 600 ppm). Extract (10–20 µl) was applied to two GPC columns and a precolumn in series provided by MZ Analysentechnik, Mainz: MZ-Gel Sdplus (5µ) 40×3 mm (106 Å) - 250×3 mm (106 Å) - 250×3 mm (105 Å). Columns were eluted with chloroform at 150 µl/min and 35°C. The eluent was monitored by an ERC-7512 RI detector. The data collected by the Kontron HPLC system were converted into ASCII files and Mw and Mn values were calculated with Microsoft Excel using chromatograms of a polystyrene molecular weight standard mixture. The identity of the PHB peaks in the GPC was checked by fractionation and subsequent GC measurement. If not indicated otherwise, contents are given as proportions of dry weight. In order to produce PHB in plastids we transferred the phb operon from R. eutropha to the plastid genome of tobacco. For integration of the operon, a plastome locus within the inverted repeat regions was targeted. The map of the plastome insertion is shown in Fig. 1. In the experiments presented, the operon containing the promoter and 5 -UTR of the plastid psbA gene was inserted between the plastid genes trnN and trnR. 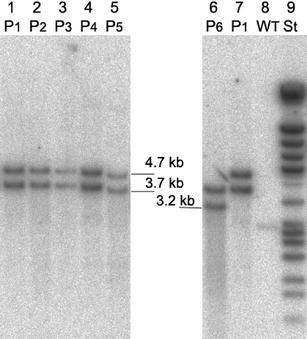 Five independent transformants P1-P5 were regenerated and analysed for their PHB contents. After transformation, correct insertion and total length of the operon in the plastome of transformants was confirmed by PCR and Southern hybridizations. Probes and expected hybridization signals of phb cassettes are given in Fig. 1, and results are shown in Fig. 2. For intact insertions, 3.7 kb and 4.7 kb signals were expected, when hybridized with phbA and phbB probes. P1 to P5 exhibited this fragment pattern correctly. We also detected operon insertions being partially deleted; genotype P6 was a deletion mutant, which lacked 1.5 kb of the operon. Regenerates which showed deletions were excluded from further analysis. As variable degrees of homoplasmy could affect PHB synthesis, it was necessary to analyse for residual wild type plastome. In order to test whether the phb operon becomes lost once spectinomycin selection pressure is removed, we transferred the transformants to the greenhouse to determine whether application of antibiotics was necessary for maintenance of the transgenic plastome. Following a 3-month greenhouse period, a further Southern analysis with the plastomic probe trnN revealed that plants were homoplastomic with respect to the operon insertion. Wild type plastome was no longer detectable when hybridized with plastid DNA flanking the operon insertion. Figure 3 shows the autoradiography of these findings. Five confirmed transformant lines were analysed by GC, GPC and HPLC for their PHB contents. PHB contents were measured by GC as shown in Fig. 4. In all determinations certain smaller peaks due to compounds with similar properties were found. In wild type tobacco we measured an average background level corresponding to 15 ppm in d.w. with a standard error of 3.6 ppm. 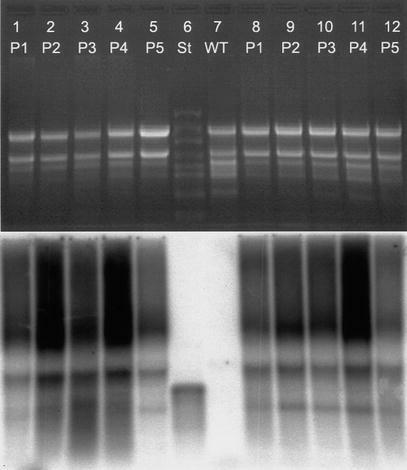 In vitro propagated PHB lines P1–P5 with intact phb reading frames under control of the psbA 5 region were analysed for their PHB contents. The average of these transformants was 715 ppm in d.w. The different transformant lines revealed a high variability with regard to their PHB levels. Fig. 5 gives the contents in ppm in d.w. for the transformants and wild type tobacco at different developmental stages. Young leaves of the transformant lines P1 to P5 were analysed directly after regeneration from callus and a second time following a 3-week regeneration phase when plants could be transferred to the greenhouse. The transformants with clearly increased PHB contents revealed growth retardation in the early developmental stages. Lines that were derived from highly expressing genotypes showed severely decreased PHB contents after a period of further growth with increasing autotrophy. For example, young leaf tissue of line P1 accumulated up to 17,442 ppm in dry weight in single PHB determinations. This corresponds to 1.7% PHB. On further growth the average PHB content of transformant lines declined to 20 ppm. For the most highly expressing plants, the main part of 3HB was proven to be polymer by dichloromethane extraction prior to gas chromatography. In line P1 with high PHB expression, the proportion of extractable high molecular weight PHB was at least 75% of the total PHB determined in dry weight. Pre-extraction with cold methanol precipitation gave an estimate of monomer content of less than 14%. Fractionation within the extractable PHB by gel permeation chromatography and subsequent quantification by gas chromatography showed that the largest fraction existed as high molecular weight PHB in the range ca. 60 kDa to 3,000 kDa. Distribution of PHB polymer sizes is shown in Fig. 6. The maximum peak was located between 320 kDa and 840 kDa reflecting a polymerization of ca. 3,500–10,000 monomers. In order to trace back decreased contents within identical transformant genotypes, PHB determination in different tissues was carried out and a correlation between age of leaves and PHB accumulation in transplastomic plant tissue was observed. 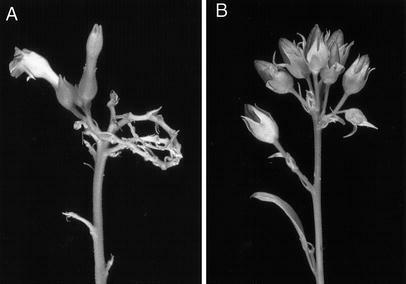 Figure 7 shows a gradient extending from lower contents in the youngest leaves to high PHB amounts in the basal leaves. To investigate the reasons for high variability in PHB synthesis, we analysed the transcription of the phb operon in the different transplastomic plants by comparing transcript expression using three probes as given in Fig. 8. Transcript analysis was performed within the plants containing the phb operon under control of the plastid promoter. DNA hybridization of greenhouse-grown transformants containing 20–50 ppm PHB with probe phbAB showed that the phb operon is expressed in two transcripts (Fig. 9): one transcript with a length of 3.2 kb containing phbC und phbA, and a second one with the length of 1.1 kb containing the phbB gene. 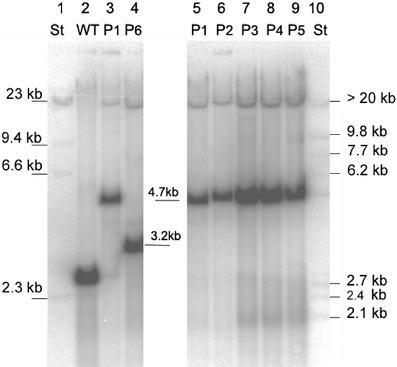 Both the probe with the 3 phbB region and the 5 end of phbB visualized the same phbB transcript, as shown in Fig. 9C. From the hybridization patterns detected we postulate the transcript arrangement given in Fig. 8. Variations in the RNA expression level between the genotypes of transformants were insignificant. There was no correlation to the variability found in their PHB synthesis. The genotype P1 with high PHB expression rates did not contain higher transcription levels than the transformants with low expression levels. In additional Northern hybridizations, we found that in some cases the amounts of the two phb transcripts were present in a non-stoichiometric ratio. As shown in Fig. 10, plant RNAs extracted from two identical lines in the same developmental stage could exhibit different distributions in their transcript ratio between the 3.2 kb and the 1.1 kb fragment. However, there was no correlation to the PHB contents determined in these plants. In order to test if the early developmental stage of the plants has an influence on PHB expression, in a further experiment, we compared the early regeneration stage with the following growth stage, in which the PHB content was decreasing. The plants P1 to P5 compared in this Northern analysis differed in their age. In the first set RNA was extracted from these plants directly after regeneration from callus and in the second set RNA was isolated from 3-week-old in vitro plants. This comparison revealed only small differences in the RNA expression of the respective lines as shown in Fig. 11. Transcript levels did not differ with the plants' developmental stage. No significant difference of RNA signals was detected by probing with phbAB. Most of the regenerates with high PHB content grew slowly in comparison with wild type tobacco. We observed a strong negative correlation between PHB accumulation and plant growth. But even moderate levels of PHB could correlate with growth retardation as observed in line P3, for example, which contained 88 ppm PHB in the early regeneration phase. Eventually all genotypes grown in greenhouse appeared healthy. However all confirmed transformants were dropping at least 95% of their flowers and were male sterile in T0 and also in the T1 generation as shown in Fig. 12. By fertilization with wild type pollen we obtained seeds but out of the complete experiment, only genotype P6 with a partially deleted phb operon, which was serving as a control, bore completely fertile inflorescences. Expression of the genes for bacterial PHB synthesis in plastids has the advantage of decreasing the risk of unwanted gene escape to the environment via pollen. In addition, site-specific integration of transgenes in the plastome generally allows a more predictable transformation event compared to nuclear transformation (Poirier et al. 1992 ; Nawrath et al. 1994 ; Houmiel et al. 1999 ; Saruul et al. 2002 ; Menzel et al. 2002 ). Here we report on significant PHB synthesis mediated by plastome-localized transgenes. Hydroxybutyric acid was produced in tobacco following transformation with an expression construct under plastid regulatory elements. PHB synthesis in transplastomic plants carrying these constructs was determined in five plants and selected material showed a PHB content of up to 1.7% in d.w. At least two thirds of the PHB was shown to be polymer with a molecular weight in a range between 100 and 1,000 kDa. These PHB contents exceeded the values measured in previously reported transformants by more than three orders of magnitude (Nakashita et al. 2001 ). The data given in this report are in the same range as those derived from our wild type control. PHB content of transgenic lines was highly variable. In addition, we found that subclones, which were initially characterized as highly accumulating, could show severely decreased PHB contents. Surprisingly there was a strong dependence of the variation of PHB synthesis on the developmental stage and growth conditions. More PHB was observed in heterotrophically grown tissue culture material than in plants transferred to the greenhouse. Transcript abundance did not correlate with the variability in PHB synthesis. In addition all positive lines showed growth retardation and male sterility. It has been reported that up to 40% recombinant protein can accumulate in transplastomic chloroplasts (De Cosa et. al. 2001 ) if the gene- or reaction-products have no toxic effects on the cells. The expression of plastome-located transgenes mainly depends on the regulatory elements used and on turnover of the respective proteins or on the insertion sites used (Eibl et al. 1999 ; Staub et al. 2001 ; Ye et al. 2001 ). Expression may also be influenced negatively if the material is heteroplastomic, as segregation events may cause a reduction of the copy number of the recombinant plastome. However Southern analysis of tissue culture material grown under spectinomycin selection showed that no wild type plastome was detectable. An additional Southern hybridization analysis revealed that the plants were homoplastomic following a 3-month period in the greenhouse. Therefore heteroplastomy cannot be the reason for reduced PHB contents. There are at least two reasons besides heteroplasmy which could possibly cause PHB expression as low as only 8 ppm as presented by Nakashita et al. ( 2001 ). It is theoretically possible that the low expression was due to a non-neutral insertion locus and that positioning between rbcL and accD gene was silencing the PHB expression. On the other hand it is possible that mutations occurred within the operon. Another important difference compared to Nakashita et al. ( 1999 ) is expression through plastid regulatory elements. Instead of an approach with the unchanged bacterial expression cassette, a different 5 regulatory element was used for establishment of the PHB pathway in the chloroplast. In our transformants the plastid promoter and 5 -UTR from the psbA gene were fused to the phb operon. It is known that both the psbA promoter and the psbA 5 -UTR confer very strong gene expression (Kulkarni and Golden 1994 ). Expression is enhanced in the light and shows some tissue specificity, which leads to increased expression in chloroplasts of photosynthetically active tissues (Stern 1997 ; Bruick and Mayfield 1999 ). Due to the plastid derivation of the psbA motifs it is assumed that the transcription rates of the three genes in this expression cassette are much higher than with bacterial motifs. In addition, the translation efficiency of the synthase gene (phbC) under control of the psbA 5 -UTR should be superior compared to the phbC translation driven through the bacterial regulatory elements. Translation of the phbA and phbB genes could be improved further by using adequate plastid spacer elements. This is relevant, as our results suggest that limitation of PHB synthesis at least did not depend on transcript abundancy. Transcript analysis has shown that there is no significant difference in the transcript expression rates between the PHB synthesizing genotypes. Experiments comparing the growth stages in which the highest PHB variability was observed have shown that these developmental stages do not affect transcript expression of the phb genes. These findings strongly indicate that the high variability of PHB content is not due to RNA expression but rather to posttranscriptional regulation events. It is questionable if a nonspecific start of transcription or processing event is leading to RNA transcripts that cannot be translated correctly. A processing event can largely be excluded, as an endonucleolytic cut would result in two transcripts of the same stoichiometric amounts. However, this was not the case; we could find the 3.2 kb and 1.1 kb transcripts in variable ratios. Additionally, PHB was formed in these plants and therefore we believe that there were intact transcripts containing the complete set of phb genes. In R. eutropha, it has been suggested that the phbC promoter drives transcription up to the termination signal at the end of the operon (Schubert et al. 1988 ). However, Oelmüller et al. ( 1990 ) described phb transcripts smaller than 4.2 kb in A. eutrophus. Peoples and Sinskey ( 1989 ) did not rule out a second promoter within the phb operon. Sequence alignment did not reveal any putative transcription initiation site. Further steps are intended, to investigate if the transcripts are intact and edited correctly. Regulation of protein levels could be another reason for posttranscriptional downtuning of PHB synthesis. Apart from the untranslated 5 regions of the transcripts, which control translation efficiency (Eibl et al. 1999 ), proteases, in particular, have a high impact on every step of plant development (Huffaker 1990 ; Estelle 2001 ). Low production can be due to degradation of one or all of the PHB forming enzymes by plastid proteases directly after translation. Another possibility for variability in PHB production is the suggestion that proteolytic activity interacts with metabolic factors, depending on energy supply. The dependence of PHB accumulation on growth conditions is an important issue. There seems to be a clear reduction in PHB synthesis under photoautotrophic conditions. The highest PHB concentrations were found in tissue culture material cultivated on sugar-containing medium under moderate illumination. Almost no PHB could be detected in leaves of greenhouse-grown seedlings, although the presence of the transgenes in a continued homoplastomic state was confirmed by Southern analysis. Growth was retarded in tissue that had accumulated considerable PHB amounts, whereas in rapidly growing tissue PHB synthesis was reduced. The large amounts of PHB, up to 1.7%, that were found in leaves of heterotrophically grown material may have been a consequence of slow PHB accumulation during retarded growth under conditions where energy was available in excess. We conclude that in tobacco a significant PHB accumulation can only be achieved if a sufficient pool of the acetyl-CoA precursor is available. Consequently, improvement of PHB synthesis in tobacco may only be reached by adjusting the acetyl-CoA levels, since there is a corresponding negative relationship between growth and PHB accumulation. Growth reduction and sterility were also reported for nuclear transformed Arabidopsis, although the PHB content was much higher in these plants (Poirier et al. 1992 ; Nawrath et al. 1994 ; Bohmert et al. 2000 ). In addition to reduced PHB synthesis under greenhouse conditions, the transformants were male sterile. It is well known that cytoplasmic incompatibilities manifest themselves in pollen sterility (Kempken and Pring 1999 ). Mature PHB plants showed a phenotype similar to wild type tobacco, but the flowers were sterile. It is not known whether the PHB-synthesizing enzymes themselves are responsible for sterility or if the male sterility is a consequence of metabolic factors. Recent results from Bohmert et al. ( 2002 ), who have expressed the phbA gene from an inducible promoter, demonstrate that constitutive expression of the ß-ketothiolase gene has detrimental effects on transformation efficiency. Interactions of ß-ketothiolase with other proteins or metabolites or depletion of acetyl-CoA from the plastid metabolism could be responsible for the flower sterility observed. In addition, as suggested by Bohmert et al. ( 2002 ) toxic effects through phbA gene expression could be due to the intermediates of PHB biosynthesis, acetoacetyl-CoA and 3-hydroxybutyryl-CoA. Our results have shown that PHB synthesis in plastids is feasible in principle. However, significant PHB contents were restricted to plants of tissue culture origin. In mature greenhouse grown plants the PHB content was extremely low. This is apparently due to intolerance of the new pathway in tobacco. Tobacco still serves as a model plant for novel transgene expression systems; however, even 1.7% PHB in dry weight would be too low for profitability and industrial applications of transplastomic PHB plants are still far away. A solution to the problem of inhibitory effects might be to use an inducible PHB gene expression system. Acknowledgements This work was supported through the Fachagentur für nachwachsende Rohstoffe (grant no. 99NR074). The excellent technical assistance by Katharina Yeiser, Stefan Kirchner and Petra Winterholler is gratefully acknowledged. Sambrook J, Fritsch EF, Maniatis T (1989) Molecular cloning: a laboratory manual, 2nd edn. Cold Spring Harbor Laboratory Press, Cold Spring Harbor, N.Y.